If you have not used BigQuery, vist here and click on try it free to get started. You can query up to one terabyte per month for no charge, which is far more than you will need to analyze our fishing effort data. You can begin exploring and slicing our fishing effort data in a number of different ways using the public BigQuery fishing effort table global_footprint_of_fisheries.fishing_effort. Its important to note that these dataset do not detail individual vessels, but shows an aggregate fishing effort within 0.01 x 0.01 grid cells for each day from 2012 to 2017. It is possible to have more than 24 hours of fishing hours within a grid cell, if more than one vessel was identified as fishing within that grid cell on a given day. fishing hours, per flag state, per gear type, per time period (day, month year), per grid cell. Clearly, there are many different ways to slice the data depending upon how you query the data. The purpose here is to provide a few simple queries to demonstrate how these public data can best processed to answer your question of interest. As a simple example, the following query can be used to determine (for 2016), the total number of hours spent fishing by vessels from each country in our dataset. We can use the SUM function to aggregate the fishing hours and GROUP BY flag to apply this aggregation to each flag separately. In the database the flag field represents each country using the alpha ISO3 designation, so China is represeted as CHN, Spain as ESP, or Peru as PER. AND _PARTITIONTIME < "2017-01-01 00:00:00"
From the above query, it looks like China had the greatest number of fishing hours in 2016 followed by Taiwan, Spain, Italy, and France. Perhaps we wish to determine the hours of fishing by Norwegian fishing vessels by fishing gear (trawler, drifting longliner, fixed gear). We can adapt the query above to aggregate by gear type rather than flag and then add an additional entry to the WHERE clause AND flag = 'NOR' which will limit the results to just those vessels that have the iso3 value for Norway. It appears that for Norwegian-flagged vessels, trawlers exihibit the greatest number of fishing hours, followed by vessels operating fixed gear and then purse seines. Perhaps we wish to identify the number of fishing hours by flag state and gear type in a particular region we are interested in. In this example, we consider a small region off the coast of Chile and we’ll just look at August of 2016. Here we aggregated the fishing hours by BOTH geartype and flag, but limit the time duration to just that time between "2016-08-01" and "2016-09-01" as well as, adding a bounding box in the WHERE clause. The bounding box identifies our region of interest by requiring all the data have a latitude greater than -39.8 and less than -36.6 and a longitude greater than -83.9 and less than -77.8. AND _PARTITIONTIME < "2016-09-01 00:00:00"
The result is that we can see this region is primarily being fished by trawler vessels flagged to China, South Korea, Vanuatu, Germany, and Poland. If we modify the query slightly to examine the entire year of 2016, but aggregate the fishing by gear type, flag, AND month we can see how fishing in this region shifts over time. From this example it is clear that this small region is most heavily fished by trawlers in July and August, with less activity the remainder of the year. If we broadened the query to look at multiple years, added YEAR(date) AS year to the SELECT statement, and year to the GROUP BY clause we could assess shifts in this pattern across years. We could even generate a daily timeseries of fishing effort and plot fishing hours over time. 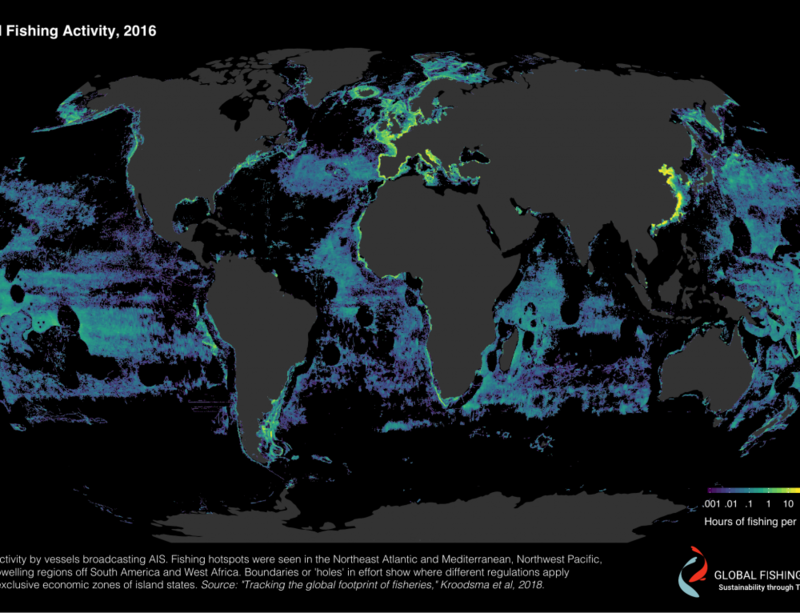 A second fishing effort dataset is also available, global_footprint_of_fisheries.fishing_effort_byvessel. Note that this dataset, while gridded is gridded at 0.1 x 0.1 degrees, and thus identifies the number of hours a vessel fished within a given 0.1 x 0.1 grid cell. As above, a grid cell may be identified with more than 24 hours of fishing per day if multiple vessels fish within that grid cell, however, a single vessel (MMSI) cannot fishing more than 24 hours in a day, though its fishing effort may be distributed across multiple grid cells if the vessel moves between them and is identified as fishing in each. Using this dataset it is possible identify vessels that may be fishing in or near areas of interest at a particular time. Using our example from above Fishing Hours By Flag State and Geartype within a Specified Timerange and Region, we can rerun the query using this dataset and identify the unique vessel identifiers for the vessels fishing in this region in August, 2016. From this query we can identify the six(6) vessels that were fishing within this region during August, 2016. If we wish to identify the specific grid cells in which they were fishing could extract that data in several different ways. Here is one simple method. If you want to get a understanding of the fishing vessels in our vessel database or want to generate some summaries of the dataset its best to query the fishing vessel table, global_footprint_of_fisheries.fishing_vessels. Using the following query we can quickly identify the total number of vessels of various geartypes that exist in our fishing vessel database, broken out by flag state. Similar analyses can be performed to estimate the fleet size by country or calculate the average size or engine power of fishing vessels. What countries have the largest fleets or have vessels that appear underpowered for their size in comparison to others? The remaining table global_footprint_of_fisheries.vessels is useful as a ‘look-up’ to identify the vessel type for specific MMSI (not just fishing vessels). In this manner we can identify this vessel as the RISING 28, flagged to FIJI, with this identity supported by both AIS identity messages and the FFA. Additionally, we find a close match between the registered geartype (drifting longlines|set longlines) and the inferred geartype ( drifting longlines, based from GFW’s classification neural network), as well as the registered and inferred vessels lengths, 42.6 meters and 43.6, respectively. The simple analyses here are simply meant to begin illustrating what can be done with this new dataset. The possibilities are enormous and we hope that you build upon these simple examples to identify new and interesting insights into the global footprint of commercial fishing.